Image credit: © Randy Floyd via Flickr. All rights reserved. Used with permission from the artist. Black, satin-like feathers on neck, body, and tail. Feathers loose, fluffy, and drooping, like emus and ostriches. Neck bare, with brightly colored skin. All three species found in New Guinea and some adjacent islands. Southern Cassowary also found in northeastern Australia. Forest; preference for old growth forests. Also forest edges, riverbanks, mangroves, and fruit plantations. Southern and Northern Cassowaries often found in lowlands; Dwarf Cassowary typically found at higher elevations. None of the three species is listed. Considered Endangered under Australian federal law. Walk, run fast. Capable swimmers. Most active in the morning and late in the day. Spend about a third of the day foraging. Rest at night. Often solitary, except for male parent and chick family groups. Interactions between adults rare outside of the breeding season. Mainly fallen fruit, but also thought to have high protein needs, at times (feed on small mammals and reptiles). Physically mature at about 3 years old; begin breeding successfully from 4-5 years old. Not well known. One study suggests about 584 g (20.6 oz) in Southern Cassowary; the average may be closer to 450 g (15.9 oz). Good swimmers; have a "fondness for water"
© 2017-2018 San Diego Zoo Global. IUCN Status updated Apr 2018. We wish to thank Dr. Andrew L. Mack and Ms. Nicole LaGreco for providing expert content review of this fact sheet. Dr. Andrew L. Mack is a conservation biologist with extensive experience working to protect tropical birds in Papua New Guinea, including cassowaries from overhunting. From 1990-1993, he conducted fieldwork with cassowaries to investigate their diet and ecological role in New Guinea rainforests. 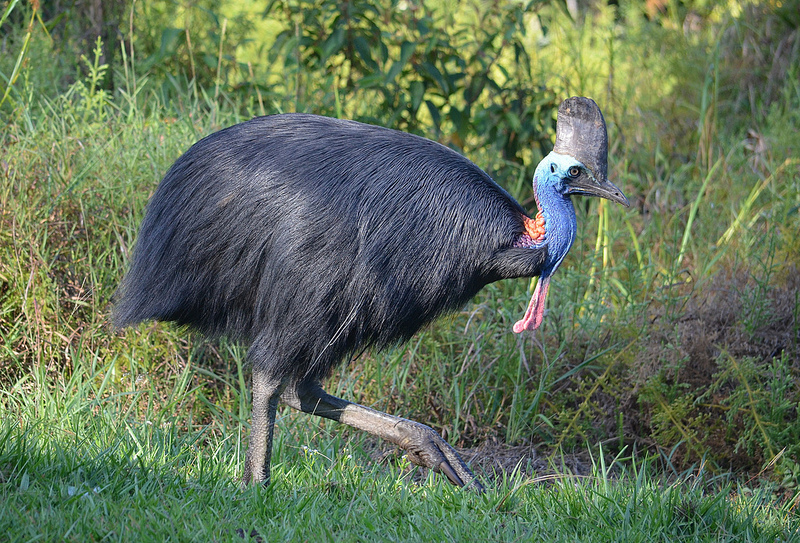 Dr. Mack has also published research on the cassowary's ability to produce low frequency vocalizations. Dr. Mack is a past Director of the IndoPacific Conservation Alliance, and has held positions with Conservation International and Wildlife Conservation Society. He is the author of Searching for Pekpek: Cassowaries and Conservation in the New Guinea Rainforest. For more information on Dr. Mack’s career, academic research, and conservation projects, visit cassowaryconservation.com. Nicole LaGreco, an Animal Care Manager with the San Diego Zoo’s Avian Propagation Center, has made significant contributions to cassowary captive management manuals, including Biggs (2013), and several husbandry workshops. She serves on the Struthioniformes steering committee as well as the steering committee of the Avian Scientific Advisory Group, which promotes excellence in bird care and conservation among Association of Zoos and Aquariums (AZA) institutions. Ms. LaGreco first became involved with cassowaries at Zoo Atlanta. While preparing for an exhibit, she learned there was no studbook. With the encouragement of her curator, she applied to become the first studbook keeper. Ms. LaGreco has held the North American Regional Studbook for 13 years and the International Studbook for 4 years (as of 2017).